There’s no doubt about it. Flowers can make you happy, as actual research has proven that. Studies have been conducted to prove the effects of flowers on a person’s emotional and behavioral state, and each study was able to show just how beneficial to a person’s emotions and feelings flowers are. In fact, flowers are linked to immediate happiness of a person, and even to a person’s mood in the long run, which relates to a person’s overall satisfaction towards life. That’s why flowers are linked to alleviation of stress, lifting of a person’s current spirit, and easing away depression symptoms and anxiety. The reason why flowers are able to do this is that it gives you a connection to nature, to something beyond your normal, fast-paced environment. Colors also make you happier through chromotherapy, which uses the powers of colors to stimulate your emotions. Now, we know the reason why flowers are considered as great gifts for any occasion. Flowers can also make you happy because by bringing your closer on an emotional level to people around you, such as family members and friends. By smoothing out your agitation and apprehension, you feel lighter, more cheerful, and more inclined to connect with other people. Flowers help you connect in relationships by improving the feelings and communication levels among people thus making a greater contribution to a person’s life. Flowers make you happy with their natural visual healing properties both physiologically and emotionally. In fact, Bach Flower Remedies lists 38 different remedies, some of which affect emotions and concerns directly related to a person’s overall happiness and satisfaction towards life. Flowers are seen to ease inner troubles, improve a person’s ability to trust, uplift a person’s confidence and self-esteem, alleviating hopelessness and despair, and regulating emotions such as envy, fear, guilt, and jealousy, among many others. There are also certain flowers connected with nurturing, romance, and tranquillity. Adding some flowers to your home and office has more effects than just decorative. Think of them as fragrant, visual therapy! Tim Stelter, Regional Vice President for FTD, traveled to Corvallis this week to award us with our designation of Top Member for 2010 and 2011. This prestigious award is given to florists with exemplary expertise in long distance flower deliveries. This is after rigorous standards are met for order handling on both local and nationwide deliveries. We’re honored to be recognized for our achievements. As early internet adopters (there were only about 20 websites selling flowers on the internet when we started), we were able to establish a good nationwide presence early on (1993). This has built into a large part of our business, and we have handled hundreds of thousands of orders for our happy returning customers. We’re proud to treat every individual order as an important emotional message that our clients trust us to deliver for them to their loved ones across the country and around the world. Inbloom has the finest order tracking and transmission technology in the world, allowing us to track every order and provide updates such as delivery confirmations on each and every order. Our flowers are always delivered by a professional florist in the FTD and Teleflora network – never left on a doorstep in a box like the mass shippers do. We want your gift placed in the warm hands of your loved one, and you to rest assured that it will be handled professionally and timely. For the finest, please visit our main web site at www.inbloom.com where you can find a wonderful selection of both floral gifts as well as items such as Teddy Bears and Balloons and Fruit, Gourmet, and Gift baskets. Gifts of flowers in response to an act of terrorism. Interesting order today…and touching – an Arab man came in in full Muslim dress – I thought he was perhaps Afghani as I’ve been there 4 times – Patty, my employee was helping him and struggling a bit with his accent so I took over. In case you didn’t know it from the news – the (attempted) bomber they caught trying to blow up Pioneer Square in Portland went to the mosque here in Corvallis for a bit. Well some stupid stupid stupid local (american) terrorist kid threw a firebomb into it a couple days after they caught that would be bomber kid in Portland. He ordered 3 quite large bouquets for the Police Department, the Fire Department here locally, and the FBI office in Portland as well as another one for the Christian Church that is letting them have their meetings in their church here in town while they clean and rebuild the mosque, which has been here for at least 25 years. IN APPRECIATION FROM THE SALMAN ALFARISI ISLAMIC CENTER. I said I apologized for my countryman who would firebomb their holy building and he said they were blessed that this local (american) kid did it at night when there were no people there and that the crazy hateful (Muslim) kid tried to kill thousands. And said he has pointed this out to his fellow Mosque members. He was a very nice good kind peaceful and gentle Muslim man. A credit to all Muslims. I just post this because it was very emotionally touching to deal with him. We hugged when he left. Flowers are wonderful emotional gifts that say so much more than words can…. Added: one week later the good people from Salman Alfari Center sent two more bouquets to 2 more offices of the FBI here in Oregon. Chocolates, fancy jewelry, maybe a word or two. All these can easily convey our feelings and emotions, but perhaps there is nothing like a beautiful bouquet of roses, or a colorful array of tulips and carnations to express what all else can’t. Particular feelings are associated with particular colors of flowers. Red may signify feelings of love and passion, while yellow may express feelings of affection and friendship. There are five color palettes, arranged in various floral combinations, that can either celebrate joy and success or chase away the blues. Indeed, the way we respond to color is a function of our deepest emotions. Flowers can certainly bring these feelings out into the open by stimulating more than just our senses of smell and sight. Flowers harness the power of the dazzling array of colors we encounter every single day. A floral arrangement, executed well and with style, can covey a particular mood without the use of words. Pastel colors, such as pale yellow, soft pinks, peaches, cream shades and pale greens, for example may connote feelings of nurturing. These colors can make us feel loved, comforted and appreciated. Flowers that come in these colors are usually given to a woman who has just given birth, a friend in the hospital or even to a bereaved loved one. Flowers of these colors can surely make one feel the warmth of a tender embrace. Daisies and sunflowers, for example, can help boost energy and elevate feelings of optimism. If one is looking to inspire feelings of romance, then the rich, sensuous colors of purples, reds, oranges and hot pinks are the way to go. Flowers that come in these colors surely recall fiery, passionate nights with just the right hint of sophistication and seduction. To moderate this fast-paced lifestyle, flowers that come in light hues of blue, misty greens, and other shades that imitate the sea and the sky can surely do the trick. Give flowers in this color to harried moms, busy professionals and anyone who can use a moment of respite amidst their hectic lifestyles. The indigo hue of an iris, for example, induces tranquility and makes one more confident, less inhibited and therefore more ready to tackle on the demands of the day. On occasions of celebration, joy, and fun, play up your flower arrangements with contrasting bold colors such as bright yellows, oranges and blues and greens. Those flowers are perfect for occasions such as birthdays, graduations, promotions and other occasions where feelings of lightheartedness can come into the fore. Indeed, such is the effect of a well-coordinated flower arrangement on our emotions that it can even influence our health! Bluebells, for example, are known to release melatonin and ultimately help us achieve a good night’s sleep. To keep allergenic factors at bay and improve your lung and immune system, try scattering orange daisies around your home. In your workplace, it has been scientifically proven that flowers can enhance productivity and energy levels, even improving memory for both the short and long term. 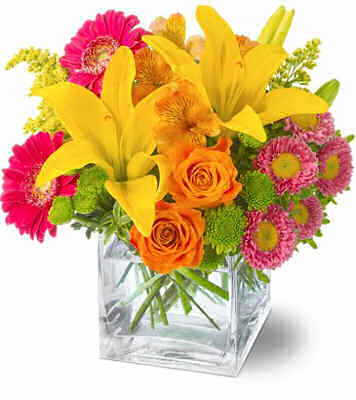 Flowers are also considered to improve feelings of camaraderie and companionship among colleagues in the workplace. 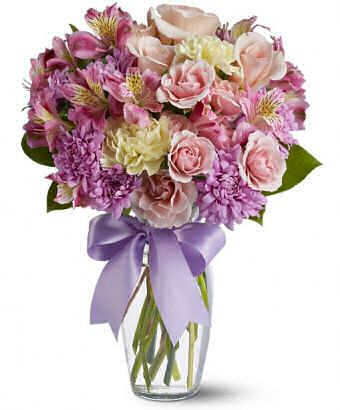 Finally, green zinnias and lilacs can help alleviate those nasty feelings of stress and anxiety. Inbloom Flowers has been recognized by Google as a Favorite Place On the Internet to shop. So last week, I got the mail and there was an envelope from Google…thought it was just an advertisement flyer and so I waited until we were finished with an event to sit down and open the mail. What a pleasant surprise! We have been recognized as a Favorite Place on Google and we have received a special packet with a sticker to place on our door congratulating us for being a favorite place that folks search for! Google identified over 100,000 businesses in the U.S.A. as a “Favorite Places on Google which was based on Google user’s interactions with local business listings…. and you, the customer chose us! This selection represents less than 1% of the 28 million U.S. businesses so we are pretty psyched. Google stated that it “believes that our standards for selecting businesses are as selective or more selective than other companies which have run similar initiatives”. So, a special thanks to all of our customers who took the time to write reviews or searched for directions to find us or just wanted more information about us …we thank you over and over for taking your time to do that! As a real local florist in Corvallis, Oregon, who actually designs and delivers on the same day, as well as a Top 50 in the NationWide FTD Florist – we are excited and this is a Grand Congratulations from Google. Thank You Google for this honor. We have our sticker going up on the window on Monday…have to wait for a bit of rain to pass and then you will be able to scan the bar code with your phones to get more information about our Flower Shop. Do you remember the last time you received flowers? Think about what you felt at that moment. What did you feel upon seeing perhaps that big bouquet of roses from your husband, or those bright, cheerful tulips your son gave you for Mother’s Day? Most probably you will remember feelings of gratitude, happiness and an overall feeling of joy. That doesn’t really come as a surprise. Experts have long ago established the link between flowers and happiness. Nature has long been providing us with simple but effective ways to alleviate stress, induce relaxation and lift our general emotional and mental health. Just being surrounded by flowers can trigger a more heightened sense of satisfaction in life, which can be translated to more kindness and compassion towards other people. Rutgers study explored the link between flowers and happiness and found several surprising facts. Although we already know that flowers are linked to emotions, we did not know the extent of such a link. Now we know that flowers not only have an impact on happiness, they have an immediate impact on happiness. Upon receiving flowers, participants in their 10-month study expressed supreme delight, shown through “genuine” and “excited” smiles. This phenomenon is true for all age groups. Flowers and happiness go hand in hand regardless of age. The study also found other things about flowers and happiness. The positive effect that flowers have on people lasts for a long time. The long-term joy that people feel when they are surrounded by flowers translates to less feelings of depression and anxiety and a better sense of life satisfaction and enjoyment. Another surprising fact about flowers and happiness is that simply being surrounded by flowers increases interpersonal communications between people. The study shows that when people display flowers in their homes, the generally feel more cheerful. When people display their flowers in their homes, such as in their living rooms, kitchens, dining rooms and foyers, it makes the place more inviting and more conducive for welcoming guests. Ultimately, they are able to carry these positive feelings even as they step outside their homes. They bring in their positive vibes as they interact with people in the workplace, for example. Flowers can help enhance productivity in the workplace and help both long and short term memory. Indeed, even senior citizens report being able to cope with the challenges of aging better when they are surrounded by flowers. Flowers and happiness, it seems, cannot be separate from one another.Today, some people practice flower therapy which is centered in the belief that our emotional and even mental states can be improved through the use of flowers. The benefits we reap from flower therapy are related to factors such as the form, smell and color of a flower. Red roses, for example, may stimulate our adrenal glands and make us more active. Sunflowers can boost our energy and make us more hopeful and optimistic. Irises can make us more confident while bluebells can help us get that important good night’s sleep. We always want Lady Fortune to smile down on us. That’s why we buy rabbit’s feet, avoid crossing under ladders, and always get out of a black cat’s way. There are many things we do attract good luck and good vibes from the universe. Yet another way of improving the flow of good energy all around is by practicing the ancient art of feng shui. Feng shui is a method of attracting good energy into our homes by organizing the spaces we live in. Since flowers make up a huge chunk of home decor, it is essential to be aware of how we can rearrange or organize flowers in a way that will bring us good fortune. Place a white vase with pink or fresh flowers on the bedside table. This is believed to bring more romance into your life. When you want happiness and laughter to enter your home, place a bouquet of chrysanthemums in it. These flowers are symbols of peace and relaxation. The Chinese call these beautiful flowers “A Heaven full of stars” or “Drunk With Wine made from the Peaches of Immortals.” With exotic, alluring names like that, how can you go wrong? If you want good luck for the whole year round, grow a narcissus or a water fairy just before the year ends. When it blooms at exactly the start of the New Year, it means you will enjoy a year of good fortune. Another good omen flower according to feng shui tradition is the peony. Peonies, especially those with many leaves and flowers, are signs of good fortune. Peonies also enhance male energies. They are symbols of affection, faithfulness and loyalty and are even thought to prevent blood disorders as well as heart disease. Green is the color of growth, so make sure you have green plants all around your home to alleviate stress, restore balance and harmony. Beware of some greens though, especially spiky plants. Some spiky plants bring in bad energy, but some believe they can also enliven sluggish or lethargy in some areas of the home. Still, it’s recommended to have at least one big plant in every room. This not only freshens the air, it also brings in good energy. Plants, especially, those with rounded leaves also encourage good fortune and good energy. These rounded leaves resemble coins and are therefore believe to bring in more wealth. If you have a walkway, the Chinese and observers of feng shui believe it would be good to line your walkway leading to the front door with flowering plants. Red flowers grouped in 3s would be best. The Chinese also believe that you should not have dried flowers in your house. Dried flowers are dead flowers so that can translate to your wealth “dying”. However, it is perfectly acceptable to have artificial flowers. Similarly, clear away clutter in your yard by trimming overgrown plants and getting rid of any cut down vegetation or cut down trees. A side benefit of this is – a vase filled with trimmings such as cherry or apple blossom branches is a beautiful enhancement to your living environment.